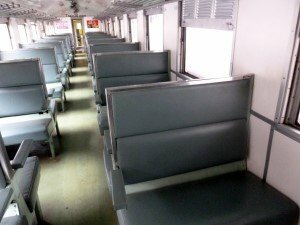 Train 171 is a Rapid overnight sleeper train from Bangkok to the Malaysian border at Sungai Kolok. If you are planning to travel from Bangkok to Malaysia by train this way, please be aware that you will be heading into the troubled South-Eastern provinces of Thailand and attacks on trains and cancellations of this sector of the route have happened in the past. Please read our Bangkok to Sungai Kolok page for more information and some alternative routes you can take to avoid any danger. If you are planning to use this service for anywhere in between Bangkok and Hat Yai there is nothing to worry about. Train 171 departs Daily from Hua Lamphong Railway Station in Bangkok. All times shown in the schedule above are departure times. Arrival times are a minute or two earlier. This Rapid service has a choice of either 2nd class air-conditioned sleeper coaches or 2nd class fan sleeper coaches. The fan carriages offer the best value for your money and can be up to 200 Baht cheaper than the air-con carriages, depending on the distance travelled. 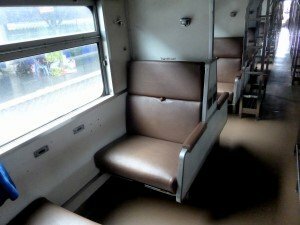 The larger (wider) lower berths come at a premium to the much narrower upper berths but are worth the little extra money, but they do sell out first, so book early if you can, especially during the peak season and other public holidays in Thailand. 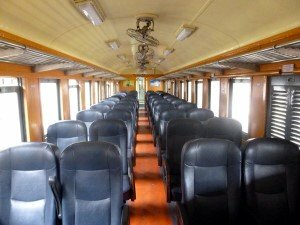 Also available on this service are 2nd and 3rd class fan cooled seater coaches. These are fine for short journeys and are a very cheap way to travel. For longer journeys the extra few hundred Baht for a sleeping berth is well worth it. Fares for Rapid trains are lower than the equivalent Express and Special Express train services as they are slightly slower and tend to stop at more stations along their route. For other main routes, please use the navigation bar on the left hand side of this page. Please be aware that the times shown on this page where correct at the time of publishing, but we can not guarantee the are still correct at the time you read this page. Call 1690 for the 24 hour Thai Railways Call Centre.